The Blue Talon clashed that one time with Daredevil back in 1972. That was back when DD and the Black Widow were operating in San Francisco, so be sure to wear flowers etc. etc..
We barely see Blue Talon in action, so there isn’t much to say about him. 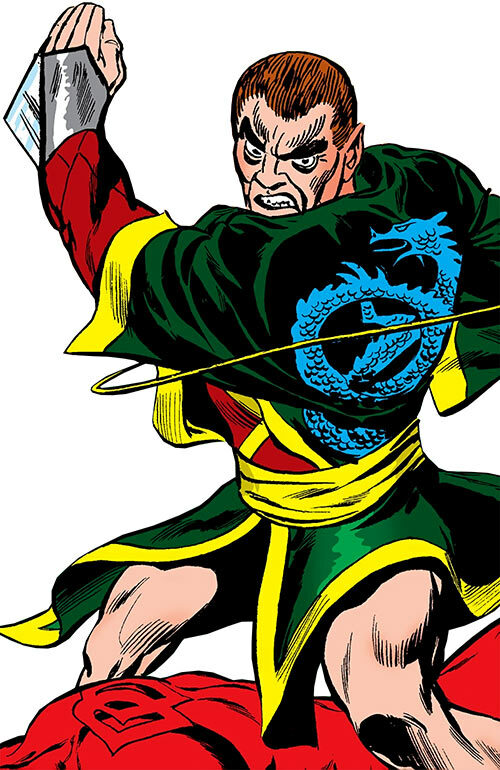 But if you need a forgotten-yet-published 1970s martial artist for a story, he could be perfect. Real Name: Yamura (first name unrevealed). Group Affiliation: Employee of Damon Draan. Height: 5’9” Weight: 160 lbs. 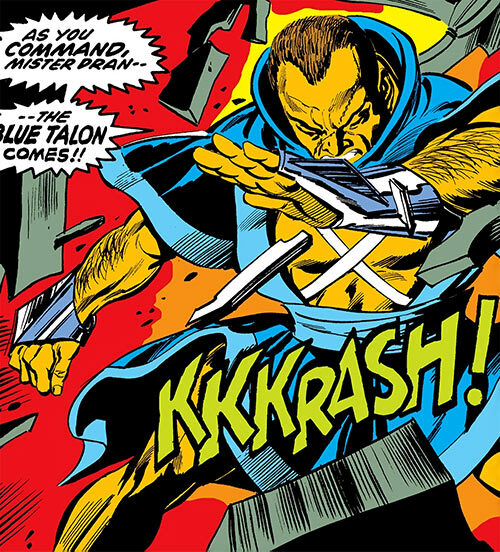 The Blue Talon is a powerful martial artist. His best techniques are deadly open-hand strikes, such as “karate chops” as we said back then. Such strikes are deadlier still thanks to steel plates over his hands. With those, he can easily demolish a reinforced door with a single blow, or penetrate several centimetres of concrete. Blue Talon is a reputed martial artist from Japan. At some point, he was involved in some kind of accident or defeat, leaving him scarred and breaking his hands. After the accident, he left Japan and, toughening his hands, became an assassin and a mercenary martial artist. 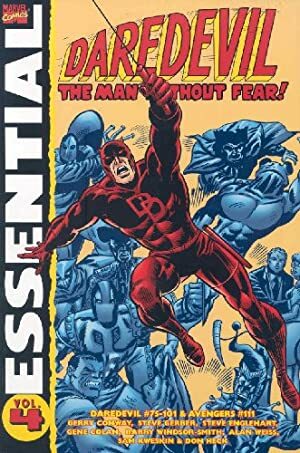 Blue Talon was in the employ of Damon Draan (who would later become the Indestructible Man) when Draan ordered him to kill Daredevil (Matthew Murdock). Blue Talon engaged Daredevil. But in the fray, he struck the ground with so much force he hit a gas main. Which ignited from sparks from his steel plates. The main exploded, and Draan later referred to having “lost” Blue Talon. But this doesn’t necessarily means he’s dead. Yamura seems bitter, aggressive and has a mean killer instinct. He didn’t take to his handicap well, and relishes in any opportunity to demolish stuff and people. This bitterness diminishes his emotions toward anything else than his condition and his assignments. He much prefers facing a skilled adversary, so he can demonstrate his worth. He could easily have been a member of the League of Assassins, indirectly working for Ra’s al Ghul. His style and costume would fit nicely in. SPR (Blue Talon’s hands are crippled and incapable of fine manipulation), Creepy Appearance (facial scar, crippled hands), Minor Rage, Unluck. WRIST MOUNTED PLATES [BODY 10, EV 02 (05 w/STR, 09 w/Martial Artist)]. The stats are guesswork – Daredevil kept using Acrobatics (dodging) during the whole combat, so it’s hard to rate his opponent. – Strength-based bludgeoning Damage 1. – Enhanced Advantages (Improved critical (Unarmed) 1, Power Attack). Defensive Roll 2, Improved Initiative, Improved Smash, Improved Trip, Prone-fighting. Benefit 1 (Wealth – Well-off), Contacts, Language (Japanese). Athletics 3 (+6), Close combat (Unarmed) 4 (+12), Deception 1 (+2), Expertise (Martial arts lore) 6 (+7), Insight 2 (+3), Perception 4 (+5), Persuasion 1 (+2). Unarmed w/plates +12, Close, Damage 4, Crit. 19-20. Handicap Blue Talon’s hands are crippled and incapable of fine manipulation. Appearance Blue Talon is visibly scarred and handicapped. Temper Yamura is a brutal, aggressive man and determined to save face. Luck Blue Talon’s life has been marked by terrible strokes of bad luck, often leaving him badly wounded. Trade-off areas. Attack/Effect PL 8, Dodge/Toughness PL 8, Parry/Toughness PL 9, Fort/Will PL 7. Points total 84. Abilities 40, Defences 21, Skills 11, Powers 0, Devices 3, Advantages 9. Equiv. PL 6. The stats are largely guesses, since there’s very little exploitable material. Source of Character: Daredevil #92 (1972).